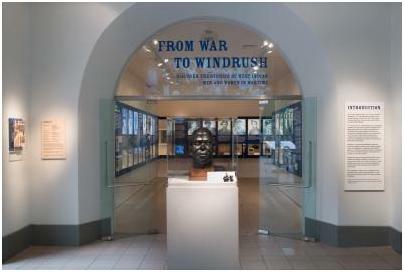 The 2008 Imperial War Museum exhibition From War to Windrush was intended to recover and commemorate, as the exhibition text stated, “the contribution of Black men and women from the Caribbean and Britain during the First and Second World Wars”. During the Second World War, positive representations of the Commonwealth were not infrequently incorporated into propaganda materials on the home front in Britain. “TOGETHER” announced posters showing British, Indian, Australian and South African forces marching in step. However, in the decades following the conflict, as Britain’s cities became more visibly ‘multicultural,’ the memory of the Second World War became an increasingly white-British affair. The dominant imagery of the Second World War has been often characterised by an exclusionary vision of racial whiteness, while the memory of the conflict has become heightened in the imagination as a privileged route into national identity. From War to Windrush worked to complete this memory of the Second World War by making visible the contributions of Black men and women during the conflict. At the same time, the exhibition usefully challenged the distinction between ‘multicultural’ Britain and Britain ‘proper’ in the way that it harnessed the charged symbolism of the Windrush. The arrival just outside London of this ship in June 1948, with its carriage of West Indian migrants, is routinely associated with the birth of multicultural Britain; however, the exhibition invoked this symbol in order to direct the attention of visitors to an earlier and significant Black presence in Britain. At stake in this exhibition then was the shape of the national narrative, its inclusions and exclusions, and its relation to notions of racial and cultural difference. The exhibition was displayed across two galleries. The first looked at events and experiences in the West Indies during the First and Second World Wars, while the second examined life in Britain. 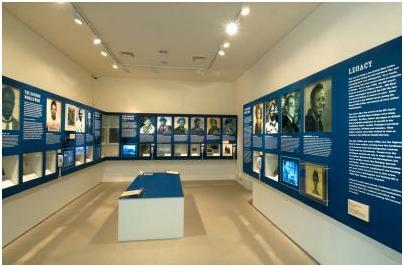 This latter gallery documented the experience of black servicemen and -women through a handful of personal narratives. Biographical information was given in the exhibition text and personal objects were displayed. In some cases visitors could listen to the oral narratives of those represented. Dominating the room were a series of large, back-lit, portrait photographs. There was a clear regularity of rhythm in the display of these images: they were of uniform scale and near uniform tone and were displayed at eye level, each showing the head and shoulders of the subject. Wherever possible, the servicemen and -women were shown in military dress. This display of unfamiliar images, in a prominent London museum, constitutes a forceful rewriting of the Second World War imaginary in Britain and creates a powerful iconography of Black belonging in the national narrative. This is so, in no small part, because it challenges an all too easy equivalence between the imagery of the Second World War and a reductive and exclusive nationalism. But this new iconography of Black servicemen and -women and, more importantly, the work it can do, is also circumscribed by familiarity with the pre-existing photographic genre of soldier portraiture and the particular sentiments that this elicits. In other words, this display of photographs was effective in large part because of the general cultural familiarity with the soldier portraiture form. Indeed, not all of the portraits in From War to Windrush were quite as they seemed. Many were cropped, facilitating their conformity to the genre. A variety of sources – including passport photographs, family photographs and group photographs – were trimmed to produce as uniform a series as possible. Clues in the images of, for instance, William Strachan and Cy Grant – such as lighting and dress – pointed to photographs made out of the studio and out of doors. But it is military portraits proper, such as those of Sam King and others, that provided the guide. The efficacy of this familiar form is that it allowed museum visitors to quickly understand the national dimensions of this narrative. In the first gallery of the exhibition, visitors were provided with the tools they needed to read this photographic genre. In one of the few places where photographs were displayed as objects, a page from a Royal Aero Club document showed four portrait photographs of Royal Aero Club pilots. The photograph bottom-right showed William Robinson Clarke, one of few West Indian pilots to have served in the First World War. Immediately above, the same image was reproduced. Backlit and enlarged at the same scale as the other portrait images used, this photograph appeared to establish the provenance of the iconography that followed. And perhaps this is where the idea of From War to Windrush as a ‘hidden history’ of Black and Caribbean contributions to the First and Second World War efforts ceases to be useful – or at least where the conditions of the appearance of this history become exposed – because, in the exhibition, the visual engenders a sense of ‘confirmation’ and ‘recognition’ of the already known, as much as it facilitates any ‘discovery’ of the new. One way to think about this might be to read the alterations to these portraits metaphorically and to conclude that whatever appeared in these photographs, but did not sit comfortably within a national frame, was cropped away. In this sense, From War to Windrush was a quintessentially multicultural exhibition in that it produced the paradox pointed up by a number of multiculturalism’s commentators; namely, the impossible containment of the new, different and the everyday within the cultural expectations of a national narrative, which privilege the historical stability of an imagined community. From War to Windrush was an important exhibition in that it brought dignified representations of Black Britons to the walls of the Imperial War Museum, drew in large numbers of London’s Black communities and expanded the possibilities for the narration of the Second World War. However, the exhibition did not seek to unsettle that national narrative more fundamentally. It was safely celebratory in tone and by retaining the memory of the Second World War as a privileged entry point into national identity continued to obstruct the memory of other, more difficult, colonial pasts. This entry was posted in Black History and tagged Black and Caribbean contributions to the First and Second World War, Black servicemen and -women, From War to Windrush, multiculturalism in the Imperial War Museum. Bookmark the permalink.